At origin, one of our trained drivers will arrive with a flat bed truck or open car carrier. He will perform an inspection noting the cosmetic condition of the vehicle. When the inspection is complete, you should look it over to make sure it is completely filled out. Once you look over the inspection report, you and the driver will sign it. One copy will be given to you. Be sure to keep this inspection sheet and compare it to your vehicle at destination. In the event you have a low profile vehicle, the driver will use 4×4 blocks of wood to elevate the front end of your vehicle while loading. This extra care helps avoid any unnecessary scraping of the front end of your vehicle during the loading process. This is not necessary for all vehicle makes. Once your vehicle is loaded on the carrier, the driver will secure your vehicle using factory specified tie down hooks. Once secure, your vehicle will be transported to our local agent. This is a picture of how the vehicles are driven onto the carrier. 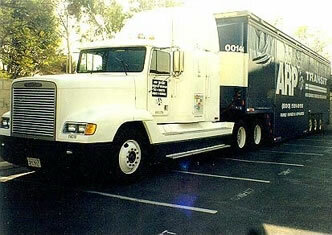 We used a large vehicle to show you the clearance the bottom level of a car carrier provides. All AutoRelocationPlus, Inc. drivers have a minimum of eight years experience. 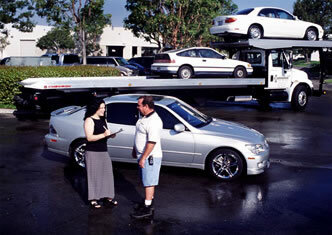 They are trained and certified to handle your vehicle move successfully. Common Question: Why does it take you longer to deliver a vehicle than if I drove it myself or put it on a household goods van? Answer: Unlike the household goods van that may load one or two households at a time for shipment, car carriers have 8 – 10 spots to fill. In most cases, a car carrier has to make a stop or pickup for each slot on their truck, thus resulting in a little longer delivery spread. Keep in mind that many of our customers pre-ship a vehicle prior to household goods and save on car rental expense at the new destination rather than waiting for the entire family and household items to make the move. When the vehicle reaches the destination it is off loaded from the car carrier at our local delivery agent or in some cases, your home or office. 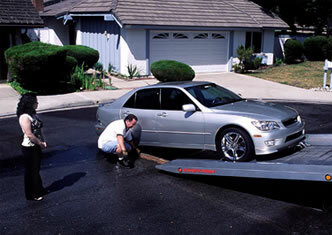 Weather permitting, it is cleaned and delivered to you on a flat bed carrier. 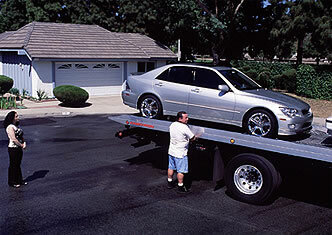 In these pictures, the vehicle is shown being lowered off the flatbed. It is your responsibility to inspect your vehicle for damage when it is delivered. 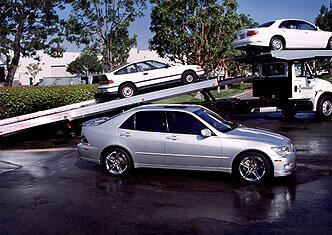 If your vehicle has sustained damage, YOU MUST NOTE IT on the delivery Bill of Lading. Once the damage is noted, contact your AutoRelocationPlus, Inc. coordinator immediately to file a claim. AutoRelocationPlus, Inc. will not be responsible for damages not noted at destination. Enclosed carrier service is available for an additional fee. Please contact your AutoRelocationPlus, Inc. coordinator for a price quote. 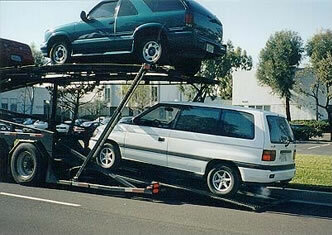 Enclosed carriers are used to ship classic cars, high priced luxury vehicles and some convertibles. It is the vehicle owner’s discretion. If your corporation pays for your move, you will need approval from your company for this service.